Wacky Watercooler September Blog Hop! WELCOME TO THE SEPTEMBER WACKY WATERCOOLER BLOG HOP! I’m so glad to see you here – if you started at the beginning of the Hop, you’ve come here from the amazing Heidi Weaver’s blog – isn’t she just so creative? I love her projects! If this is your first Blog Hop with us, let me give you a little background… Why Wacky Watercooler? Well, it comes from the name of a thread on a demonstrator-only site; the thread (or conversation) was started by a long-time demonstrator named Darrah, who felt that it was good for us to have a place to gather, and chat about things not necessarily work-related. You know; just like a ‘physical’ office has it’s water cooler, or coffee pot, for you to hang around and chat with your co-workers. So, it was suggested that us like-minded (read, ‘wacky’! LOL) ladies would start a monthly blog hop, to share what we love to do – which is create! The Hop goes in a circular fashion; each of us has our blog linked to the next one in the circle, so no matter where you start, as long as you keep clicking on the ‘Next’ (or ‘Back’) button, you’ll go all the way around, and see all the blogs. If at any time you get lost, or want to just randomly hop about, you can click on the ‘Home’ button, and you’ll be taken to the Wacky Watercooler Blog home page, which has a list of all the participating blogs and links (I also have a list at the bottom of my page). This month we decided to focus on the upcoming seasons and holidays; whether it’s Fall, Hallowe’en, Winter or Christmas – we’ve got them all covered for you! So without any more blather on my part – here are my projects! I decided to focus on Fall – which is kind of funny, as I don’t have any stamp sets that are ‘marketed’ specifically for Fall! So I’ll show you how you can use your stamp sets for the occasion you need. I used more than one stamp set for this card; the wreath is stamped from the fabulous Wondrous Wreath set; and the sentiment from Flower Patch. I wanted to try to capture the colour of the turning leaves in Autumn, so I used a great technique for achieving multiple colours – the Baby Wipe technique! I folded a Baby Wipe (yup, the same kind you use for their bottoms – but this one was clean!) and randomly dropped drops of re-inker in Hello Honey and Tangelo Twist. I then inked the biggest wreath stamp directly from the baby wipe, and stamped onto Whisper White card stock. Then I wanted to add a little bit of green – after all, the leaves don’t all change at once – so I inked up the smaller of the wreath leaf stamps in Old Olive, and stamped it on top. The sentiment was stamped in Blackberry Bliss and I cut the ends into banners, and inked the edges with Hello Honey ink and a Sponge Dauber. A bow of Blackberry Bliss 3/8″ Stitched Satin Ribbon finishes off the wreath. I layered the wreath on top of a panel of Hello Honey card stock that was embossed with the Lucky Stars embossing folder, over a panel of Park Lane Designer Series Paper. I call this card ‘Holiday Home for Thanksgiving’! It combines 2 of my favourite sets from the Holiday Catalogue; Holiday Home,and White Christmas. I started with a card base of Pumpkin Pie, then a layer of Hello Honey card stock. On the top panel of Whisper White, I stamped the trees and hills from the White Christmas stamp set. To make the trees appear more like fall than winter, I used the same Baby Wipe technique as I did for the 1st card; in fact, I used the same baby wipe! I simply inked the leaves stamp from Holiday Home with the baby wipe, and randomly added the leaves to the trees, and a few on the ground. I wanted to add some background colour, but didn’t want it to be dark, so I used my Aqua Painters with Soft Sky for the sky, Old Olive, Crumb Cake and some Pumpkin Pie ink pads for the ground. I then stamped & cut out the houses using the Holiday Home stamp set and matching Homemade Holiday Framelits Dies, and did a bit of colouring again using the Aqua Painters and ink pads, to keep the colours light. I used the terrific Good Greetings set – which you can get for FREE just by having a qualifying Stampin’ Up! party or personal order – to stamp the ‘Give Thanks’ in Tangelo Twist, then added the little pumpkin (stamped in Pumpkin Pie ink, of course) from the Holiday Home stamp set. I punched it out using the Modern Label punch, and popped up the houses and sentiment using Stampin’ Dimensionals. For my last project, I decided to go 3D! See those little ‘crescent shaped’ cuts in the top flaps? Those slide nicely together, holding the box closed. You don’t even need ribbon – but I does look nice! 🙂 You can make these boxes with Designer Series Paper, or Vellum, or Card stock, but I chose to use the new Under the Tree Specialty Designer Series Paper, which is a card stock weight kraft sheet that has a colour print on one side, and white printed patterns on Kraft on the other side. As you can see in the picture, both sides would be wonderful to use. I decided to use the side with the Garden Green & Kraft print, as it worked in for my Fall theme, here. Can you see the other theme running through my projects? That’s right – I used the Baby Wipe technique yet again! This time I used re-inkers in Real Red, Pumpkin Pie and Hello Honey, and inked up the Oak Leaf stamp from the ever-popular Lovely as a Tree stamp set. I then used the Chalk Talk Framelits Dies to cut it out, and inked the edges with my Crumb Cake ink pad and Sponge Dauber. The ‘Enjoy’ sentiment is stamped in Garden Green ink from the set ‘Num Num’, and cut using the tag in the Hamburger Box Bigz Die. 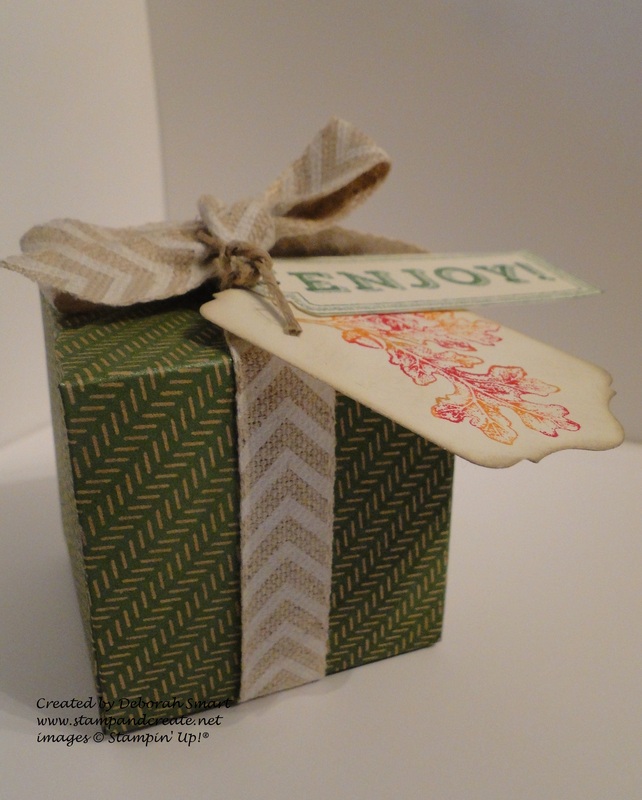 I tied the tags to the lovely Natural 5/8″ Chevron Ribbon, and tied it around the gift box. Perfect for filling with a special treat or gift for someone special! Well, I hope you’ve enjoyed my projects for this month’s Wacky Watercooler Blog Hop! Thanks so much for visiting my page; I would so appreciate it if you would leave me a comment, so I know that you were here 🙂 If you’re following the Hop forward, you’ll be heading from here to the fan-tab-ulous Kath R.’s blog – I know you’ll love what she has to share with you! Just click the ‘Next’ button, and you’ll be off! If you’d like to order any of the products that were used in my projects, just click on the pictured item below, and you’ll be taken directly to my store. Until next time – Happy Stamping! Previous Previous post: 100 Days Until Christmas! Next Next post: Creation Station Blog Tour – Harvest Party! Hi Deb, I had the same problem as you as I didn’t have much “Fall” products (at least nothing current) so I see you and I had some similar wavelengths in thought, but still came up with completely different projects! I love that! thank you for sharing! Great minds think alike, Ter! 🙂 I think we both managed quite well. So glad you’re part of the Wacky team; thanks for your comment, and sharing! Great projects! The houses are cute going off the card. The wreath is lovely. Thanks for your lovely comment, Jackie! I really like the baby wipe technique you used. it really adds a lot. TFS. Never thought to mix two of my favorite stamps from the Holiday Catalog–love what you did with Holiday Home and White Christmas! I’ll be playing with them this weekend. Thanks for sharing a great idea. Wonderful projects just right for Fall. Thank you, Kath! I’m glad we both take part in these Hops; I just love everyone’s creativity! 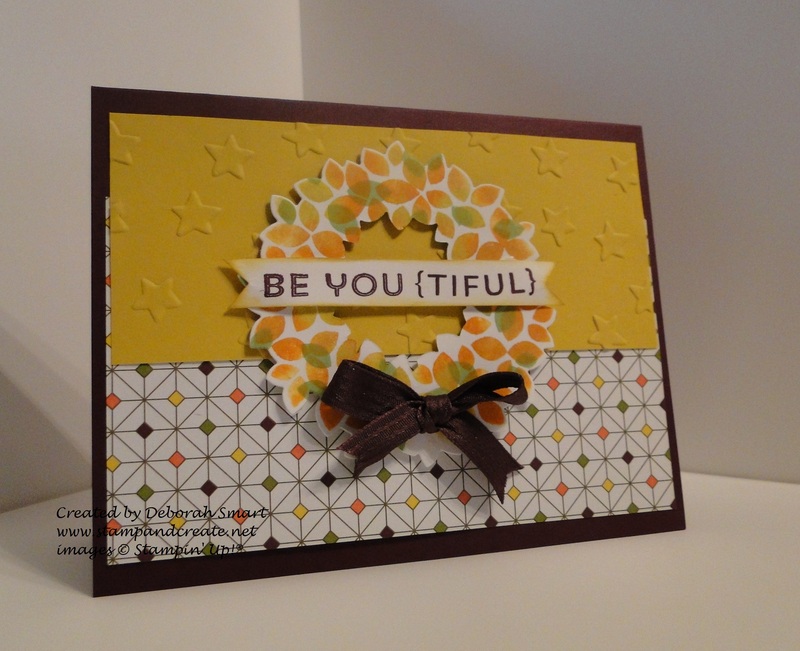 Be YOU tiful cards and projects!! Love them all – thank you! You’re so clever, MaryJo! Thanks so much for taking the time to leave a comment; I love reading them 🙂 Glad you enjoyed my projects! Karen, I’m so happy that you stopped by, and liked my projects! 🙂 I’m a great enabler – you really must get the Holiday Home set – it’s so versatile! Thanks for your kind comment, my friend!